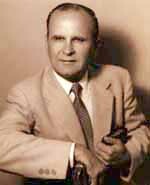 The name William Marrion Branham who is called the healing prophet was commonly heard among the Christendom. William Branham was born on 6th April, 1909 in Burkesville KY, USA. 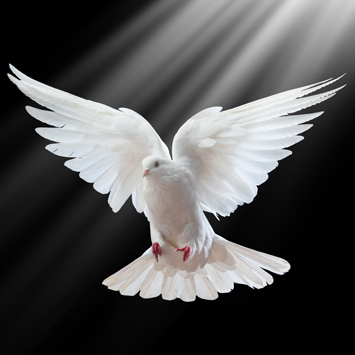 There are many adventurous and supernatural events that took place in his life from the time of his birth until he was commissioned by the Angel of Lord to forerun the ministry of second coming of our Lord Jesus Christ. The world is fully aware about his incredibly God blessed ministry comprised of signs and wonders . In the Bible the ministry of Lord Jesus Christ despite the fact being the manifestation of the mighty God was questioned by Sadducees and Pharisees. His personality was unique embodied with many attributes such King of Israel, Prophet, Rabbi, God, Son of God, Perfect Man etc. It was not ordained for each individual to perceive His office,only few chosen could get that privilege of His revelation. The righteousness is always concerned with the time we are living in. God sent Gabriel and John the baptist prior to His birth and earthly ministry respectively. We also understand that all scripture is spiritually discerned where objects might unction the meaning of subject to line up with the God's Word which cannot be seen with literal imaginations. 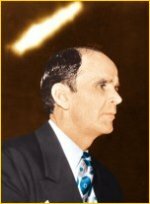 The ministry of our Bro William Marrion Branham was undoubtedly Biblical fulfilling scriptures of our day( Malachi 4:5,Rev 3:12,Rev 10:7). He is also addressed with different identities:False Prophet, Elijah, Jesus Christ , and God Branham are common among these . Dear brethren only breathed Word of God can bear witness about the truth he preached during his ministry. Following is the short description about the two supernaturally photographed pictures during his Ministry. In Houston, Texas, in January of 1950, an amazing photograph was taken by the Douglas Studios. This supernatural being was witnessed many times in his ministry. The photo was scientifically examined to determine whether the photo could have been the result of improper exposure, developing or retouching of the light.Science was unable to spot anything hence was not left with any conclusion other than to declare it as the first supernatural being ever photographed. To our belief it is the same Angel of the Lord sent ahead of Moses to guard him along the way to bring Israelites to the promised land. On February 28, 1963 it happened - about 40 miles northwest of Tucson - when Seven Mighty Angels came from the heavens at the speed of light. According to book of Revelation chapter 10: the appearance of Lord in the cloud was the fulfilment of the scripture preceding to the proclamation of the revelation of Seven Seals. The seven angels of Elohim spirit seen by John the apostle are the same angels which formed the mysterious cloud.The Cloud had been advertised in Life Magazine on may 17, 1963 and in Science Magazine on April 19, 1963. After all scientific data gatherings and examinations ever done .The cloud still remained mystery. 1963 April Vol. 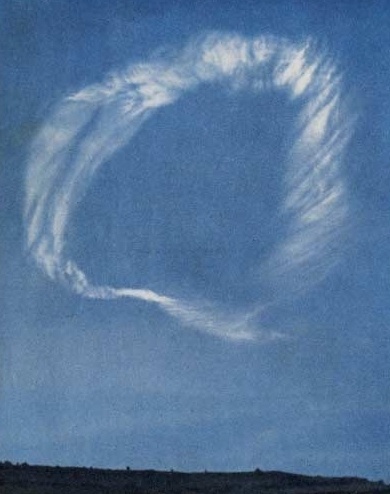 140 No.3564 The cloud was at least 11 kilometers higher than the upper limit of possible jet control formation , and was at least 5 kilometer higher than previously reported clouds of the arctic type. Its true nature is still unknown; more photos are being sought for triangulation purposes . Our purpose is to share this precious Message spoken through the mouth of God's servant Bro William Branham.